X Opus is the project of composer and multi-instrumentalist James Williams and The Epiphany is his debut work on Magna Carta records. As the principal Williams composed the music and played and/or programmed all of the instruments heard on the album. Dallas-Fort Worth area singers Brian Dixon and David Crocker provide the vocals. 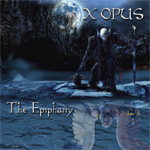 The larger canvas of The Epiphany is melodic heavy metal with notes of power and progressive metal as well. Mostly, however, the entire tapestry is an outlet for Williams neo-classical guitar playing. You'll get this in very first minutes of the opening track Terrified where he show his substantial talent. This song along with the following On Top of the World and Pharoahs of Lies are ambitious mixtures of heavy and power metal. They're all fine songs, but melodic power metal with virtuoso guitar work as expected. I'll Find the Truth offers your first twist of interest: it's fast-paced quite catchy piece of straight melodic metal. Then Williams brings In The Heavens, a slow and steady song that reminds more of strict, slightly doom-laced, heavy metal. After the instrumental interlude of the title track, Williams cranks things up a bit. I Will Fly and Forsaken are the two longest tracks, but also the ones with the most diverse and interesting arrangements. Here the nods to the progressive side of metal are self-evident. Here also Williams truly flexes his neoclassical guitar muscles. There's enough and versatile fiery fret work to make both fan and aspiring musician quite happy. Perhaps the only downside here is some of that aforementioned predictability on the power metal side and in the inherent density of the longer tracks; Williams packs them full. As to the vocals of Dixon and Crocker, they're metal, but you might find the vibrato a tad monotonous. Composer James Williams spent two years creating The Epiphany, and his efforts are well-rewarded with a fine work. His strong compositions and excellent guitar work make the album a strong and entertaining debut. Recommended. Composer James Williams spent two years creating The Epiphany, and his efforts are well-rewarded with a fine work. His strong compositions and excellent guitar work make the album a strong and entertaining debut.